A common issue we see in applications is the order in which they import DLLs at runtime. This is referred to as a Load Order Vulnerability that can result in local privilege escalation. It became popular a few years ago after the release of a Microsoft Advisory for a number of Microsoft products. In this blog post we'll dissect the vulnerability, exploitation scenarios, and how to fix it. In simple terms if an application (e.g. Test.exe) loads a DLL (e,g. foo.dll) by just the name, Windows follows a specific search order depending upon whether “SafeDllSearchMode” is enabled or disabled to locate the legitimate DLL. If an attacker has knowledge of this application, he can place a malicious DLL in its search path with the same name as the legitimate DLL forcing the application to load the malicious DLL, thus leading to remote code execution. SafeDLLSearchMode places the user’s current working directory later in the search order. Combining carpet bombing with unsafe DLL loading: When the victim visits a malicious web page, attackers can make the browser automatically download arbitrary files. This is referred to as Carpet bomb attack. This flaw leads to remote code execution if the vulnerable application checks in the desktop directory first for resolving the DLL. For example, Safari Web Browser was vulnerable to carpet bomb attack. Internet explorer 7 loads sqmapi.dll when it runs, suppose this DLL gets downloaded in the victim’s desktop directory by a carpet bomb attack IE7 loads the malicious DLL and executes arbitrary code. 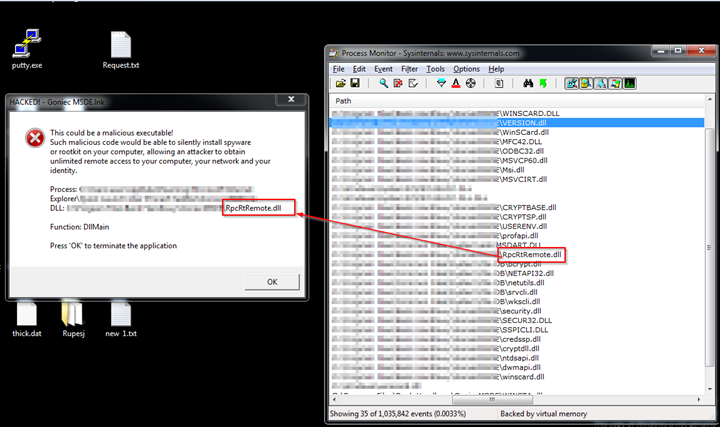 Sending the victim an archive file containing the shortcut to vulnerable application along with the malicious DLL . Since many vulnerable applications resolve the missing DLL in the startup directory this can be used to load up the malicious DLL upon clicking the shortcut to the vulnerable application. This can also be combined with carpet bombing attack. Opening a document can load certain files placed in the same directory as the document. Attacker can send an archive containing the document along with a malicious DLL to exploit this kind of behavior. This occurs when an application fails to resolve a DLL because the DLL does not exist in the specified path or search directories. If this happens, a malicious Dll with the same name can be placed in the specified path directory leading to remote code execution. Start your application and observe process monitor output, look out for dll’s that are being searched for in the current directory, system directory etc. There is a good chance that these Dll’s could be vulnerable. Also identify DLL’s that are not present in the specified directory, this can lead to component resolution failure issue. Wherever possible, specify a fully qualified path when using the LoadLibrary, LoadLibraryEx, CreateProcess or ShellExecute functions.